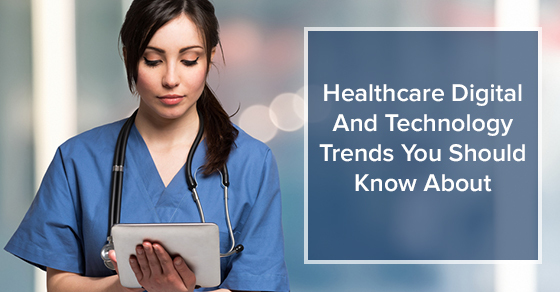 The healthcare sector has relied on technology since its inception. As we move towards smart cities—smart cars are already here—we’ll eventually see the smart hospital becoming the norm. We’re not quite there yet, but there are digital and technology trends pushing their way forward in the healthcare sector that will make our (and our doctor’s) lives easier. We’ve come a long way from the first digital X-ray machine. The following digital and technological innovations are already here, and they’re not going anywhere. The last two years have seen the smart watch go from a niche piece of jewellery to something everyone is wearing. Current smart watches give you the opportunity to leave your phone at home and still make calls, send texts, listen to your favourite podcasts and track your exercise. However, we’ll soon see smart watches getting a health-related makeover. Sensors are being added to our watches to allow them to track more than our heart rate; we’ll be able to know if we’re at risk for heart disease or going into cardiac arrest. Who knew our smart watches would one day be able to save our lives? Hospitals and clinics used to rely on manual data entry and written calendars to schedule appointments. Now, tracking and booking appointments is easy with advanced scheduling software. Patient information is centralized in one location, giving healthcare professionals access to digital files so they don’t have to record anything by hand. Moreover, this software automates everything from appointment reminders to record keeping and billing. Patients will get health information and reminders through SMS or email, and can even schedule their appointments online. When we reach our golden years, we often have to sell our homes for the sake of our health. This will no longer be the case, as smart homes are quickly becoming the preferred choice for the elderly. With fall detection monitoring, emergency services available through voice command, and the ability to contact your doctor via your smart watch, selling your home when you get older will be a thing of the past. Digital health interventions like the ones mentioned above will only get stronger as technology improves. The healthcare sector was one of the earliest adopters of the digital world, and this industry will continue being on the forefront, using new tech to saves lives.